This is Jake Mailhot’s second post as part of his May Residency at FanGraphs. A lifelong Mariners fan, Jake now lives in Bellingham, Washington, just a little too far away from Seattle to make it to games regularly, which is sometimes for the best. He is a staff editor at Mariners blog Lookout Landing. He can be found on Twitter at @jakemailhot. Fastball velocity is one of the main factors at which analysts look when attempting to predict pitcher injuries. When a pitcher suddenly starts throwing slower than before, alarm bells start ringing. Sometimes it’s nothing; more often than not, though, it’s a pretty bad sign. Having said that, let me present — without any other context — a velocity chart for a starting pitcher from 2016 through this season. That’s a pretty disturbing downward trend. But as far as we know, this pitcher isn’t injured. In fact, he might be the healthiest he’s been in his major league career — and he’s thrown a no-hitter this year as proof. If you haven’t guessed already, the pitcher in question is Sean Manaea. He’s throwing slower than ever before and thriving. As a prospect in the Royals organization, Manaea touched 97 mph with his fastball and sat in the mid-90s regularly. By his rookie year, he was averaging around 93 mph on that same pitch, a touch above average for a left-handed starter. This season, it’s sitting barely above 90 mph. And the average velocity on his other pitches is down a touch, as well. The velocity drop last year can be partially explained away by his poor health. He reportedly lost 25 pounds over the course of the year because of a new ADHD medication, sapping him of his strength and stamina. He addressed the issue over the offseason and regained his strength and health, yet his fastball velocity has dropped again this season. But instead of alarm bells, we’re witnessing a version of Manaea that’s better than any we’ve seen before. He’s doubled his strikeout-to-walk ratio, cut more than half a run off his FIP, and is pitching much deeper into games. There’s a little dissonance to Manaea’s newfound confidence. After all, every extra mile per hour adds to the tiny margin for error pitchers already face. But with his repertoire, maybe he can get away with reduced velocity. Looking at the physical characteristics of his fastball reveals a pitch that is unique. In the table below, I’ve taken each component of his fastball and compared it to the league average four-seam fastball using a z-score. Manaea’s fastball has over two standard deviations more horizontal movement than the average four-seam fastball, the highest mark among all four-seam fastballs thrown at least 100 times this season. The pitch also has a ton of sink to it, more than three standard deviations more than the average four-seam fastball. The pitch-classification algorithms denote his fastball as a four-seamer, but the pitch bears greater resemblance to a sinker. But even when we compare his pitch characteristics to an average sinker, it’s still a standout pitch. His horizontal movement is still over a standard deviation more than the average sinker and would rank 23rd among all sinkers thrown at least 100 times this season. That unique movement has helped him generate an above-average whiff rate on his sinker and an abnormally high pop-up rate. Perhaps the reason Manaea’s been able to thrive with reduced velocity is because his fastball is pretty nasty no matter how fast he throws it. He’s also locating his fastball differently this year. In previous years, he would keep his fastball away from right-handed batters. This year, he’s hitting spots on both sides of the plate. With the amount of movement he gets on his sinker, locating inside to right-handed batters is risky. If he doesn’t locate on the edge, the pitch naturally moves back towards the middle of the plate. Perhaps that’s why he’s given up three home runs to right-handed batters off his sinker this year. Overall, though, he’s limiting them to just a .140 batting average off the pitch. 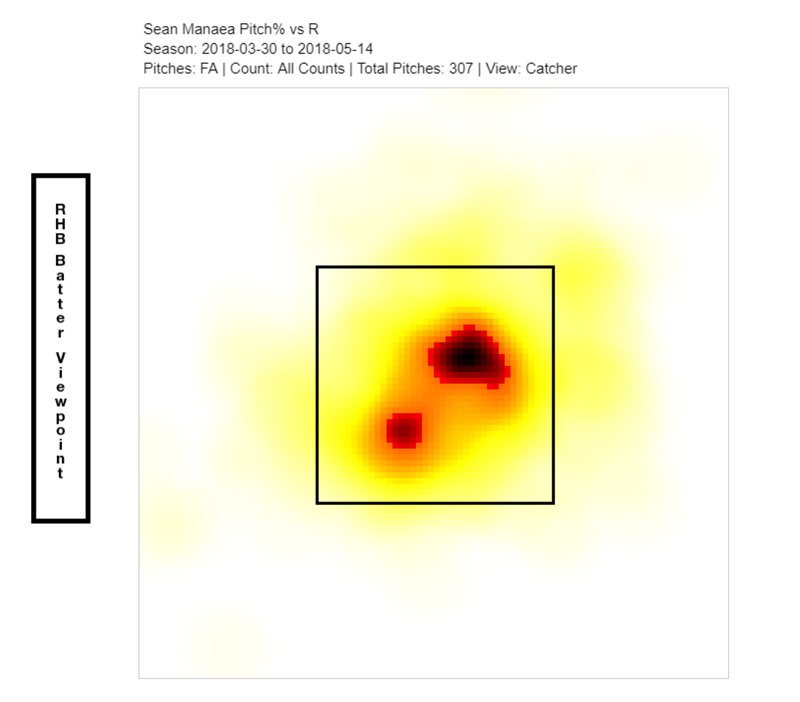 Of course, Manaea wouldn’t be the pitcher he is without his secondary pitches. His slider is a known quantity. It’s the reason why left-handed batters have posted just a .247 wOBA against him in his career. His changeup has been a work-in-progress however. 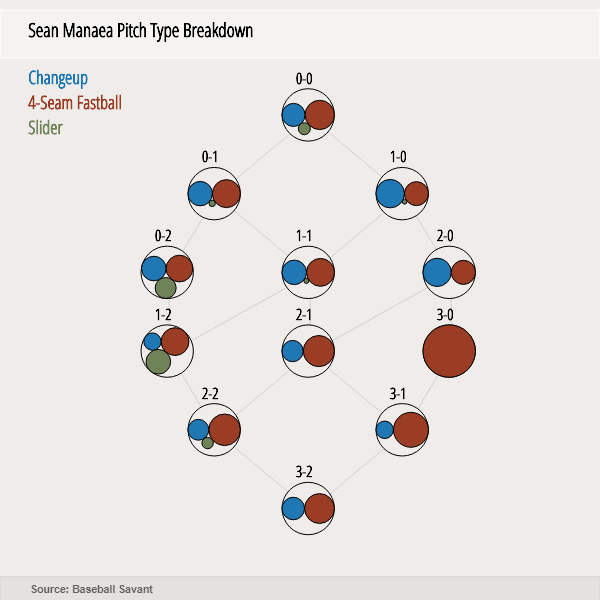 In that same piece for The Athletic, Manaea told Sarris that he had changed the grip on his changeup this year, from a standard circle change to a split-finger changeup. That adjustment has helped him add almost an inch more depth to the pitch. That added sink has helped him induce a ground ball exactly half the time an opposing batter puts his changeup in play. Part of the confidence Manaea expressed to Sarris comes from a maturation on the mound. As his manager Bob Melvin put it earlier this year, “He’s finding a way to pitch without a 95 mph fastball. He’s learning how to pitch.” With just three pitches in his repertoire, Manaea needs to work hard to keep batters off balance. With a biting slider as his only breaking pitch, he’s limited himself to just two pitches against right-handed batters for the most part. Looking at his pitch usage by count, we see a pitcher who is much more unpredictable this year. Last year, when he fell behind in the count against a righty, Manaea would turn to his changeup just 28% of the time. This year, it’s almost an even 50-50 split when the batter is ahead. He’s also mixing in his slider earlier in the count to try and steal a strike. 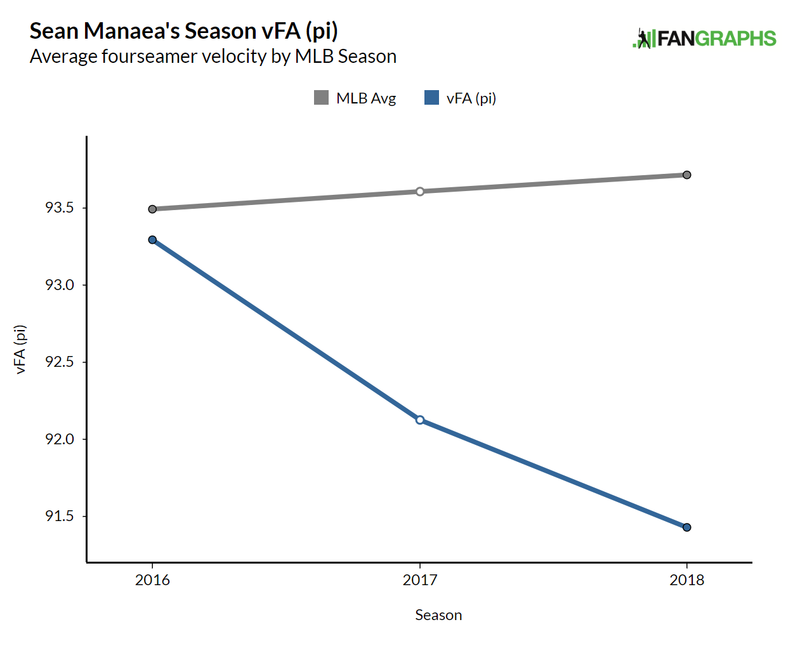 Despite a velocity trend that might otherwise elicit concern, Manaea is thriving. He’s throwing all three of his pitches with confidence and is continuing to mature on the mound. His progress must be a breath of fresh air for the pitching-starved Athletics. We hoped you liked reading Sean Manaea Is Slowing Everything Down by Jake Mailhot! Now imagine how much better he would be if he had his old velocity back! You probably aren’t going to get the increased movement with the higher velocity, but sure…let’s just imagine! He’s definitely a better pitcher.